Ed Tech/Web 2.0 Tools for Educators and Students: Make typing in links easier for students using URL shorteners. Make typing in links easier for students using URL shorteners. URLs like the example above are extremely long and I have known teachers, administrators and other staff try and have other people type URLs like this in the the address bar. For those who have tried that before, you will know that unless your eyes are perfect, you can type well, and you are close enough to the projector screen or white board to see the whole URL string, this can be a big royal pain and can cause frustration from your students. So, geniuses out there came up with a great idea. Lets take the long address/URL and generate shortened links, and I am very grateful to them for these awesome strategies and techniques. There are three URL shorteners that I use. Each one has a specific feature that I like so I use them as specific situations arrive. 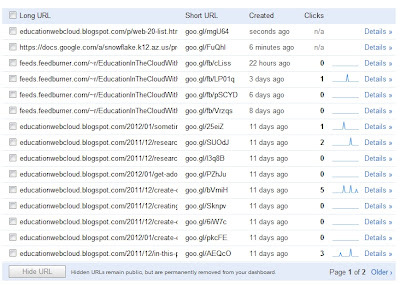 I use the Google Url shortener when I use cites like Twitter or Facebook. 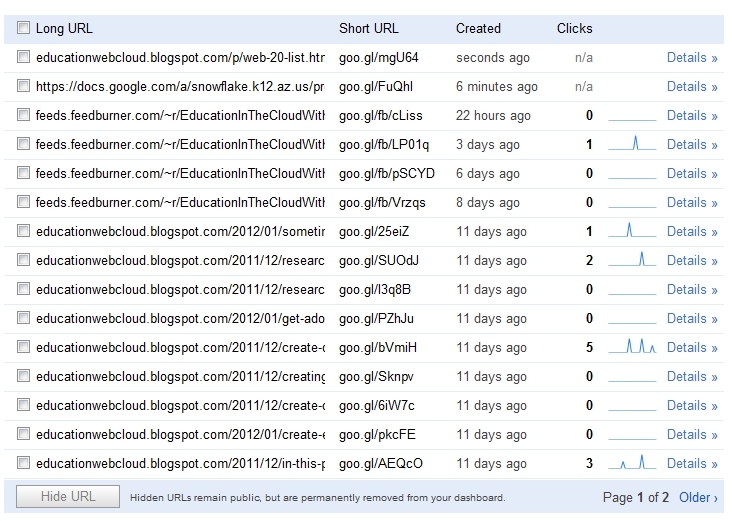 It make is really easy to track how many times that link was clicked on as well as shortens up my posts. 1. Highlight the URL from the web page that you want to have shortened. 2. 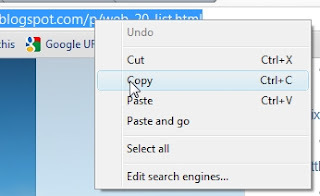 Right click on it and click on the "Copy" option. 3. Go to http://goo.gl . If this is the first time using Google URL shortener you will need to log in to a Gmail account. 4. Right click in the box that says "Paste your long URL here:" and then click your "Paste" option, and then click on the "Shorten" button. You will now see a link to the right of the button that is much shorter. Copy it and paste it where you would like. 5. If you so desire you can log in later and see how many people clicked on your link. 1. Once again copy the long url address to the blog or website you want your students to go to. 2. Paste the URL into the "Enter a long URL to make tiny:" box. Before click on the "Make TinyURL!" button, also give your URL a specific name. Not it has to be completely unique from what anybody in the world has already done, so if it comes up and says that it is already take, just add the number "1" after it. When you are ready click the "Make TinyURL!" button. 3. This will take you to another page where you can copy the address. Now CiteBite.com is really cool, because you can give a URL and actually state where on the website you want your students to go, so that they don't have to go hunting for the information. Great time saver! The disadvantage is it doesn't shorten the URL as much as I would like, but if I want my students to go to a specific part of a specific website, then I use CiteBite.com. 1. 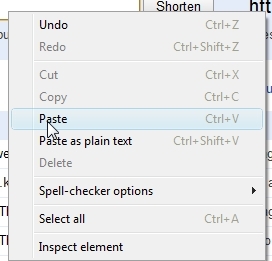 This time you need to copy and paste two things. First you need a quote from the specific part of the page you want your students to go to. It doesn't have to be long, just unique from everything else on the page. In this case if I want my students to go to the section on Presentation Makers, I would copy the words Presentation Makers. 2. Go to citebite.com and paste the quote into the "Quote" box. 3. Now go back and get your longer address from the website and copy and paste it into the "Source URL" box. Then click the "Make Citebite" button. 4. You can now copy the link and paste it to whomever you want or on the board where your students can copy it to their computer. Again, this link will take my students to the Presentation makers portion of my blog or website. Please share these tools with your students and staff as they can potentially save you all a bunch of time and frustration. These tips and tricks only take seconds as well.